We were experiencing the remnants of Hurricane Isaac, so it was rain & fog on and off all day. 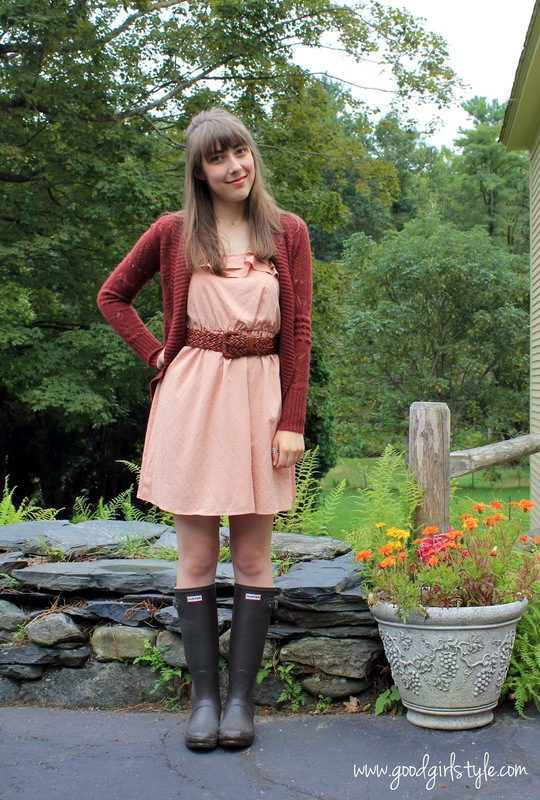 This outfit took me from the office to the farm perfectly well! I'm telling you: A farm bathed in fog, wrapped in love, warmed with the happiness of old friends...it was wonderful. It was just what I needed: a tour of the lush vegetable garden, a good romp with the new little baby cow, and collecting eggs in a red pail. We enjoyed a dinner composed of everything fresh from the farm, served in cast iron, with linen napkins and monogrammed silver. In the quiet after dinner, we started to catch up on life. Old friends need to do that, you know? To sit, and stare at the last of the beeswax candles burning down into the silver candlesticks, and to say to each other, "So, how are you?" in a voice that begs the real answer. The night ended with a round of hugs from some of the best hug-givers I know, and the most precious gift of a beautiful, beautiful cake plate. I will cherish it. See how the dress has little gold polka-dots? So cute. Just because I happen to like fashion doesn't mean I don't LOVE a good "country girl" day. Oh yes, I love a good Country Girl Day. And I absolutely adore this certain family who occasionally takes me in as one of their own, lets me play country girl, feeds me, encourages me, and sends me on my way, bearing the most beautiful gifts and a heart full of inspiration and happiness. You look lovely, a real country Girl and I love your Rubber Wellingtons they look so cool on your bare legs.